Just about six years ago I started this blog. Now, according to Blogger, this is the 1000th post (assuming I haven’t deleted any along the way… which I might have… I can’t remember…). Since Blogger started keeping stats for me in July of 2008 There have been nearly 350,000 pages views and there are now nearly 400 public followers (Really!? Who ARE all of you!?). For the record, the most popular pages have been A Ranger and a Mage Walk into a Forest… (with 1678 hits -1200 of them were in the first couple days of posting it. I have no idea why it got so many… Someone, somewhere with a LOT more followers must have linked to it), The DPM Painting Tutorial (with 1639 hits - I’d really like to do more stuff like this… it’s just so… time consuming!? ), Vietnam in 28mm (with 1204 hits), the very out of date (and no longer “complete”) 28mm Moderns Complete! (with 955 hits), and King of the Hill (with 520 hits). Anyway, it’s been a lot of fun sharing my hobby with you all and I greatly appreciate all the feedback, comments, and encouragement. 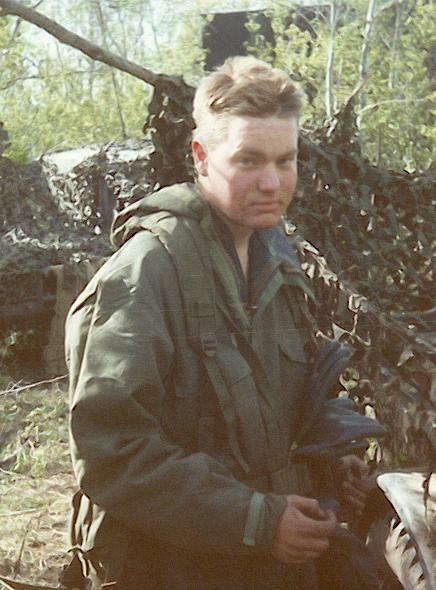 This year I turned forty. I celebrated by hosting a DBA Campaign - something I’ve wanted to do for over twenty years. 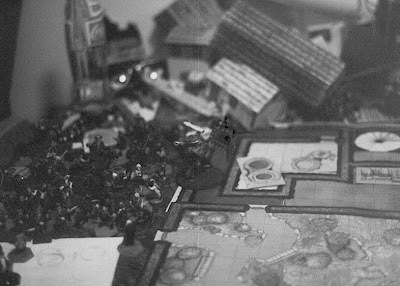 AT this point I’ve been gaming with miniatures for nearly 30 years. 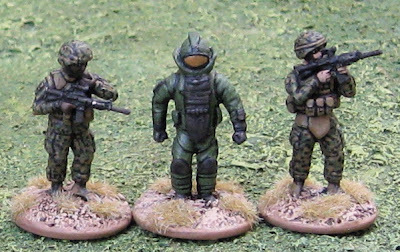 Later I picked up a handful of sci-fi figures and modern-ish figures for Traveller and Top Secret. I always wanted to track down a copy of Striker, but was never able to. 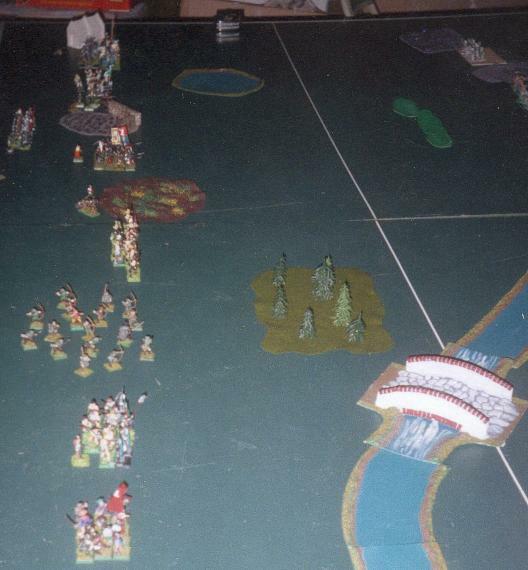 The first real miniature battle game I bought and started building armies for was Warhammer Fantasy Battle (3rd Edition). I had Orcs at first (mostly Ral Partha – this was before anyone really cared who made your minis and other manufacturers minis were even pictured in the WFB books!). Later I built an Empire Army (which was mostly Citadel historical minis) and then a Bretonnian army. The earliest pictoral evidence of my hobby, circa 1989. Teh original photos are actually in black and white - I didn't do that in an image editing program to make it look "old". I was taking a Journalism class in high school and we did a photography section and shot B&W film. That's my first "real" historical unit. An Indian colonial unit. Looks like some Naval Brigade with them. Probably Ral Partha. 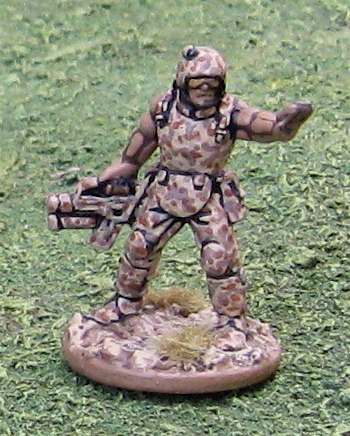 I'd started building units hoping to play some colonial actions using The Soldier's Companion from GDW's Space 1889. 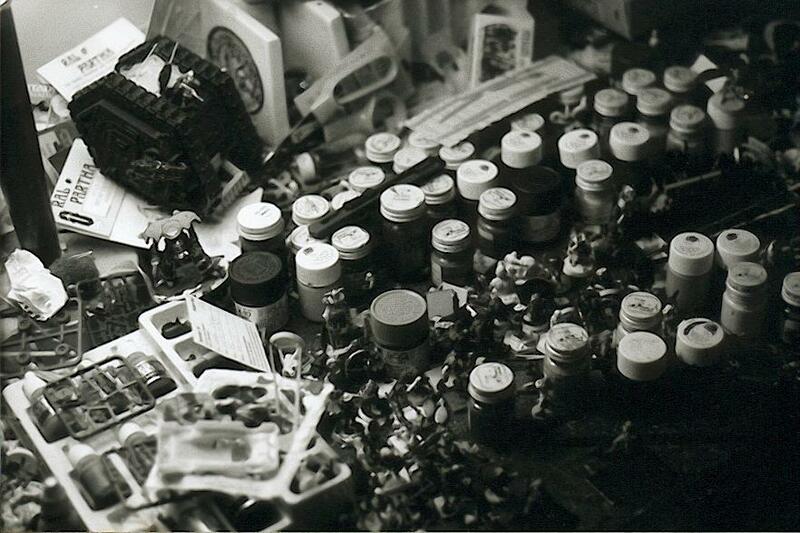 My painting desk looking about as messy then as it does now. Some things never change. Old School Land Raider.... Minifigs Zulus... Paranois Robots... Call of Cthulhu Dark Young of Shub-Niggurath... British Camel Corps... Many of those I still have. Some I wish I still had. 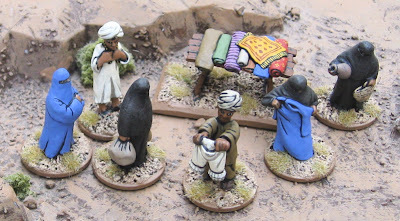 I had a stab at running a few campaigns – mostly they fizzled very shortly after starting, mostly due to guys who were much cleverer than me at figuring out how to break the point system contained in that initial volume. None of the books that followed (Warhammer Armies, Realms of Chaos, etc.) seemed to help… By the time the Fourth Edition came out (the first boxed set with plastic minis) I was ready to pack it in. That's Mikey K in the background, so his elves must be on the table. 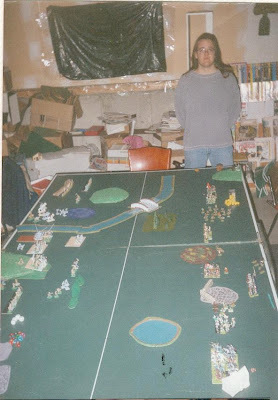 This may have been during the last attempt I made to run a WFB campaign - using the original Mighty Empires - we shared a border with Jay V's undead realm. My Bretonnians readying for some epic battle against Jay's undead. Me and the Bretonnians in John Burt's basement. 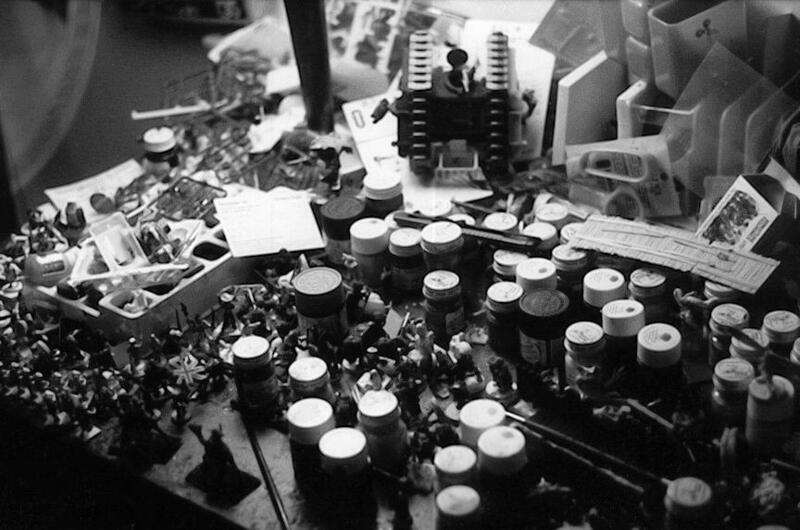 At some point Cory, Mike and I replaced our armies with 15mm versions… and picked up a few others… and then everybody went their separate ways. I didn’t do much gaming for a few years. No one to game with – or at least no one with an opposing army. That's me in that NBCD suit. 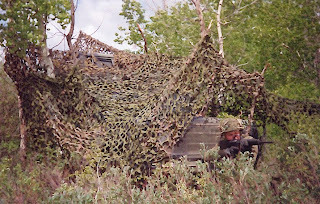 Hero Pose of me and my camouflaged truck. 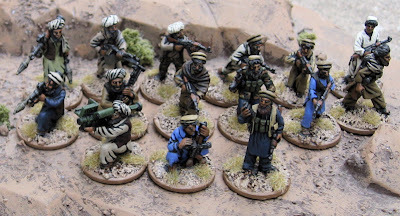 Around the turn of the millennium I got back into gaming – building some new DBA armies and this time building two (and later more) opposing armies, so I’d never be left high and dry if an opponent moved away… not that I HAD any opponents. I picked up a few other odd things here and there. Tried out Stargrunt II and Dirtside II. 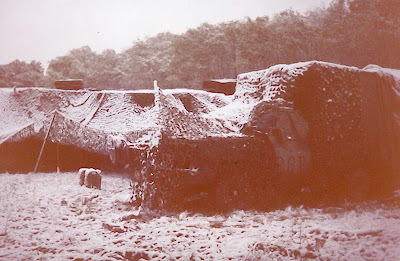 I played the latter with homemade tanks made of bits of wood and toothpick or finishing nails. Both of which I really liked, but again, could never find players. I always wanted to try out Full Thrust - but was never able to track down a copy. Then I met John Bertolini by chance. 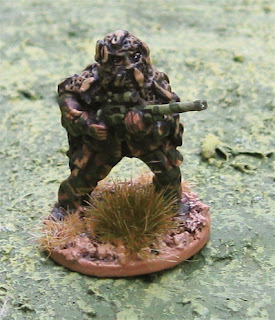 I was working in a magazine store and he came in a bought a copy of Miniature Wargames – which usually, at the end of each month, I stripped off the cover and took home for myself!? Finally I’d found someone else whose primary interest was HISTORICAL miniature gaming! We played some Russo-Japanese War games with rules he’d just made up. These are actually some pictures John's wife Amy took of our very first game. We are using some of John's fabulous collection of homemade Russo-Japanese War figures. John took the Russians and I took the Japanese. I think I scared the willies out of him (and I'm sure he was wondering if he'd invited a madman into his house) as every time I had a remotely successful dice roll I threw my hands up in the air and yelled "BANZAI!!!" (I think I'd recently read Keiji Nakazawa's Barefoot Gen). Japanese cavalry advancing to the front in column! I have no idea who won... as is the case with most games I've played with John. Dice were rolled. Fun was had. I got to yell "BANZAI!!" We tried some Seven Years War games using something based on DBA. We’ve since played more than a few games of Ever Victorious Armies and Contemptible Little Armies and more games that he’s made up. 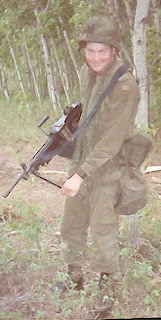 Later I dragged him out to play some WW2 games a long with another new friend, “Other Tim” (Tim Miller), then owner of Reader’s Bookshop Saskatoon. 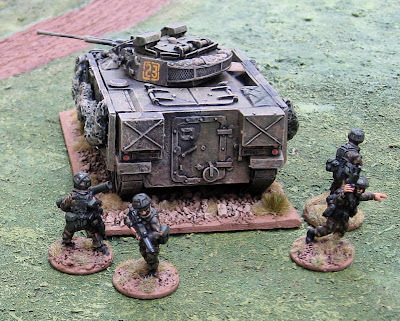 We tried out a number of different WW2 games (first with 20mm/1:72 plastic, and later 15mm): Tactical Commander, a Warhammer 40K WW2 variant, WRG’s Armour and Infantry, some super simple skirmish rules published in an old Wargames Illustrated, Crossfire, and finally Flames of War. 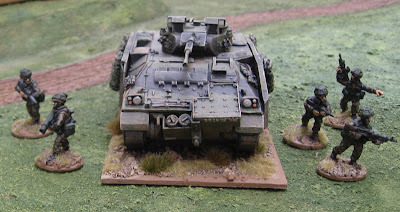 I ended up running a few Flames of War leagues before burning out and tiring of the warhammer style play… and around that time I started this blog… You can go back and read the blog to see what sort of shenanigans I’ve been up to since. Hmmmm… this has turned into a History of Tim’s Gaming Shenanigans… originally when I sat down to type this I’d thought I do more of a What I Do When I’m Not Painting Toys and Playing Games…. Sometimes I’m not entirely sure why I have a separate blog for that. I think it’s because I was planning to chronicle role-playing campaigns there and wanted to keep THIS blog strictly about Miniature Wargaming. The lines between “role-playing” and “miniature wargaming” have always been pretty fuzzy for me though… I’ve always used miniatures in my role-playing games and I’ve always maintained that the very best miniature wargames are when the players are “role-playing” the commander of the troops on the table (rather than a lawyer representing them in a case to determine a BEST WINNER!). I briefly attended university on two occasions. First majoring in Physics, the second time Studio Art. I never completed a degree. Meh. Um…. Is there anything else you want to know? Ask now! 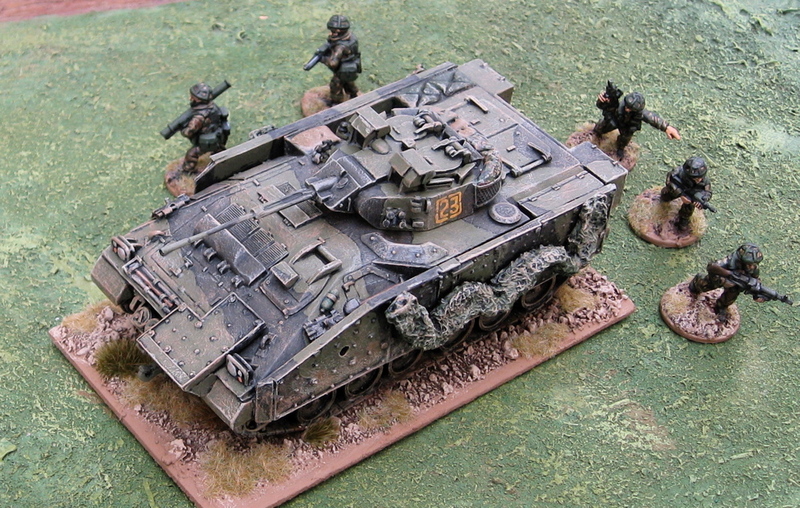 Or should I just shut up and get on with the posting of more pictures of toys and battle reports? Monks, Marines, and Menacing Mammals! 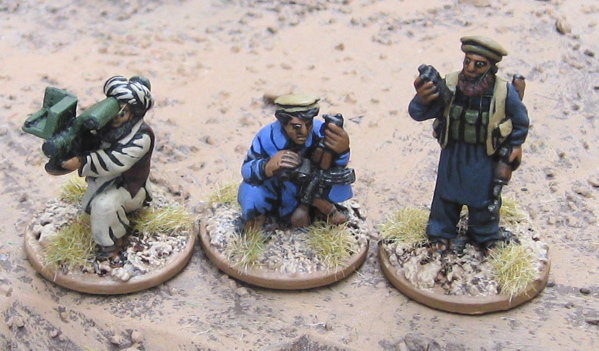 Command section for my USMC Platoon from Empress Miniatures. The figures are listed as “Army”, but I’ve painted them in MARPAT to use as Marines. 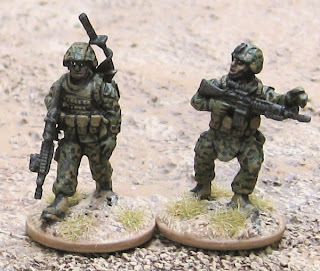 I’m not sure how different their kit is otherwise… There’s some minor differences in the figures. Not sure if that’s actually a difference in the cut of the uniform, etc or just style of sculpting… Regardless, they’re “close enough” for my purposes. EOD team from the same. 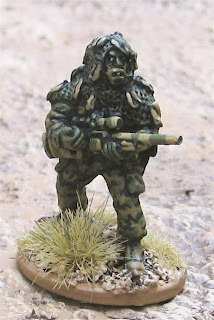 Not really a Marine… He could be a Future/Space/Colonial Marine - like the ones from Aliens (which this chap is clearly inspired by)? … Anyway… the figure is an old Grenadier Model. 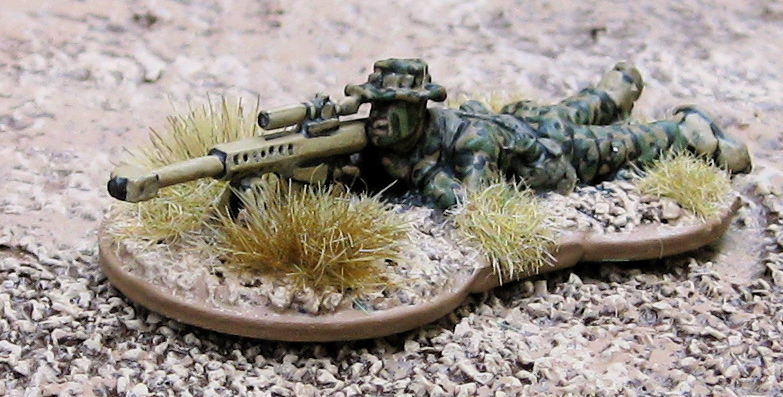 This line is currently available from EM4 Miniatures. 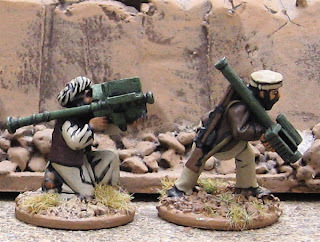 I have a handful more of these I’d like to get painted up for Tomorrow’s War. Fluffy Bunnies from Black Cat Bases. There was a fourth one in the pack... but I'm saving it for a Hordes of the Things element. According to Blogger this is the 999th post I've put up on this blog… I think I’ll have to come up with something special for post #1000… Stay tuned…. 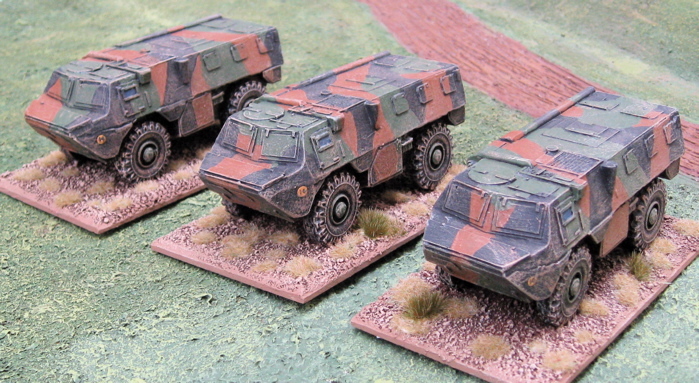 Finally some armoured transport for my Frenchies…. Three Renault VAB (Véhicule de l'Avant Blindé) from S&S Models. 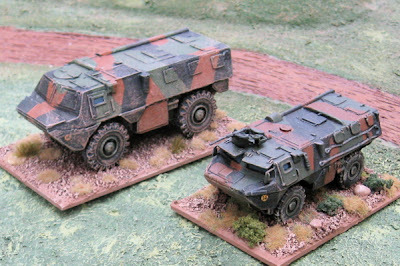 A little light on details – no gun or gun shield, no rear view mirrors, closed armoured panels over the front windshield… Which I suppose makes it easy to paint… but seriously, how are they supposed to drive? By the Force!? 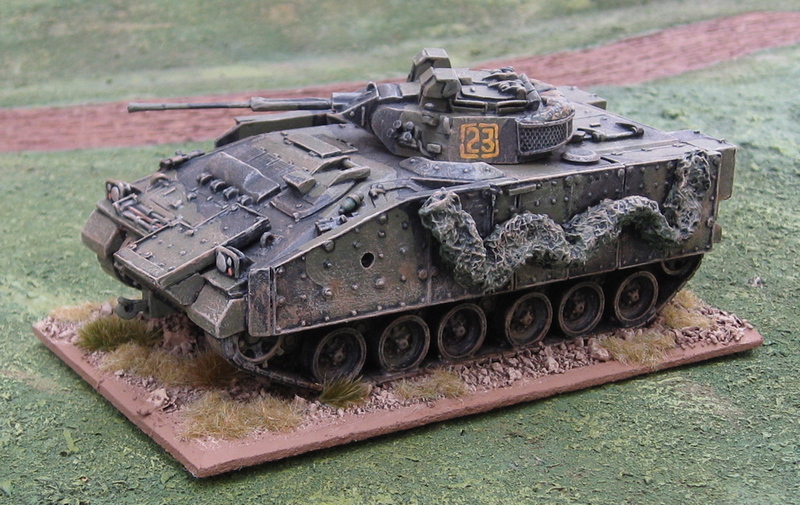 The casting quality was also no where near as nice as the Imprint Models Warrior MCV I just finished. 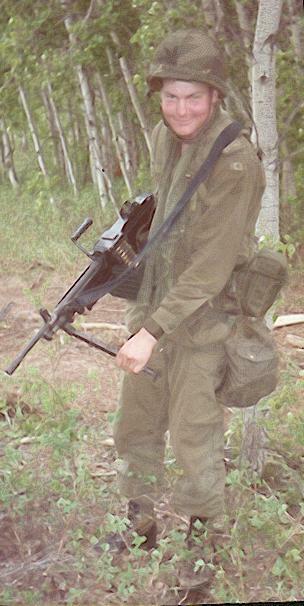 Seen here with my Eureka French Foreign Legionnaires. Comparison with the Heller 1/72 plastic kit. Patrol ready to go out. I’m sure a platoon is supposed to have four VAB. But when did any unit ever have a full compliment of serviceable vehicles? Or full-strength manpower, for that matter? The breakdown of the modern French Platoons is a bit different from other western platoons. It seems there’s a four man platoon command (Officer, Sergeant, Radioman, Designated marksmen). I’m assuming these assents would, theoretically, be split up among the four vehicles. Then there are three Combat Squads and an AT Squad. The combat squads break down into Squad Leader and two, three man fire teams. 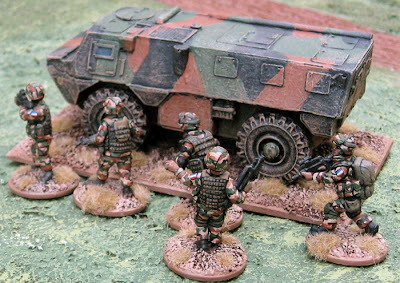 This is what I find really different – most other western armies have (in theory) four man fire teams. What I don’t get is what happens when units are understrength…? Do they amalgamate and just field fewer fire teams per platoon to keep 3-4 men in a fire team? Or do they have “fire teams” of one or two men!? 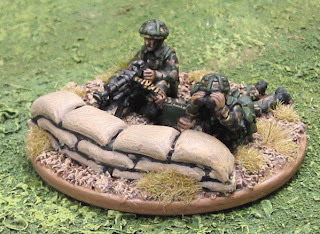 So far I have about two sections worth of generic British infantry in helmets from The Assault Group. My plan was to do about a section worth of each of the other hat guys available: Paras, Highlander, and Fusiliers – that I could mix and match with to fill out at platoon with a bit of “flavour”. 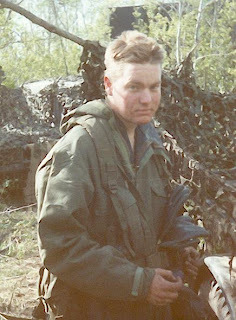 Of course they “currently” aren’t wearing DPM anymore, either… and most of the conflicts they’ll be serving in are completely fictitious…. so…. Black Watch Armoured Infantry it is!! Huzzah! 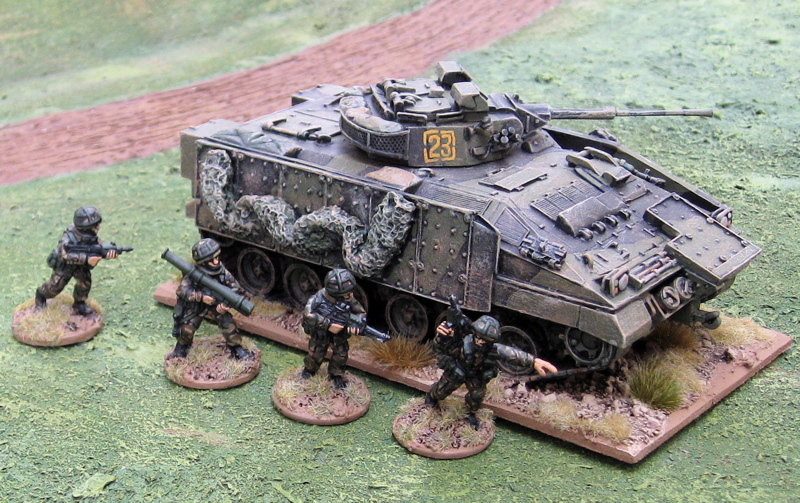 I have to say these are lovely models. The detail and casting quality are the very best I have seen by far! 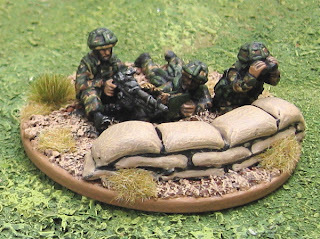 The figures are from The Assault Group. If I understand the markings correctly this would be the vehicle for 3rd section, 2nd Platoon, Bravo Company. The hatches are all serarate metal bits so they could be modeled open or closed. I’m going to have to find some spare heads (or model a few) for the next one to have some unbuttoned turret crews and/or drivers. 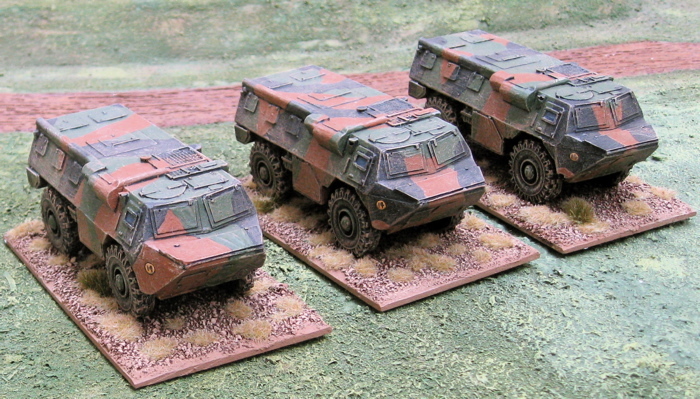 The question isn’t whether I’ll be ordering more from Imprint… it’s WHICH models I’ll be ordering NEXT!? I think I might go for some AAVP-7A1 for my growing contingent of modern USMC. Hard to say… I have some modern Africans on the workbench and a whole bunch of Modern Vehicles; some die-cast repaints, some 1/48 plastic kits (including some Challenger 2)… The SEAL team from Eureka… A handful of modern British to finish up… Some WW2 stuff still waiting in the wing…. Command or Forward Observers and a Stinger missile launcher. This is the beginning of a Modern United States Marine Corps force. WHY and I doing a Modern United States Marine Corps force!? Well… Eureka had these miniatures… and they were very pretty… and… well, you get the idea. I realize painting them in the Arid (or desert) MARPAT or even the Three Colour Desert pattern would probably have been more useful… but when has anything I’ve even done made any sense whatsoever…? The whole force (so far...). As mentioned these are all from Eureka Miniatures. 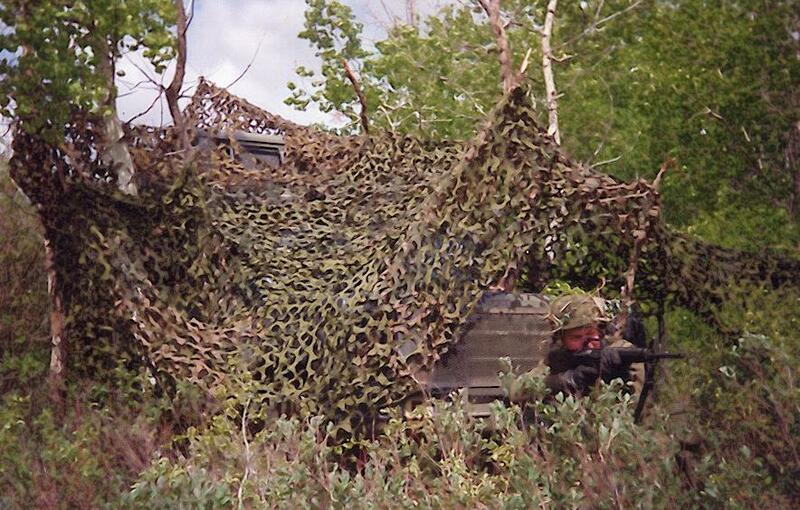 What I have there is a full strength section of regular marines along with a Force Recon patrol and a sniper. 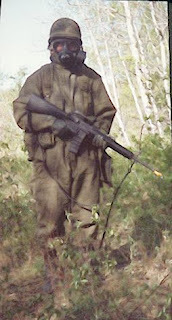 The Force Recon patrol – ready for intelligence gathering deep behind enemy lines! Another Sniper!? This figure is actually one of the many surplus The Assault Group SAS Snipers I have that I’ve painted up in MARPAT for use with these marines.